In December, 1937, Franklin Roosevelt wrote out instructions for his funeral and burial. The four-page document, kept folded in an envelope in Roosevelt’s personal safe in his bedroom at the White House, was discovered only after he was interred on April 15, 1945. The instructions are detailed, with most tending to reinforce minimalism. While the document wasn’t found in time to inform planners’ decisions, the commemoration hewed to some of the specifications that FDR had set out years before. Eleanor Roosevelt remembered that the couple had discussed a mutual aversion to the practice of “lying in state,” and so the planners skipped that tradition. Other aspects that FDR’s mourners got right, by chance or intuition: the initial small, closed ceremony in the East Room of the White House; the use of a gun carriage to transport the casket (in accordance with a military funeral); burial in the garden at the Roosevelts’ estate in Hyde Park, New York. The rector of the St. James Episcopal Church officiated at the Hyde Park service, as FDR desired. But even if the instructions had been discovered in time, and the additional service FDR requested in the Rotunda had been held, the Reverend Endicott Peabody (headmaster of Groton during FDR’s time at the school, and a longtime spiritual advisor) would not have been able to officiate; he died earlier in 1945. Click on the image below to reach a PDF of the full document. Scroll down to read my transcript. Click to view PDF of full document. Via the Franklin Delano Roosevelt Presidential Library and Museum. 1. 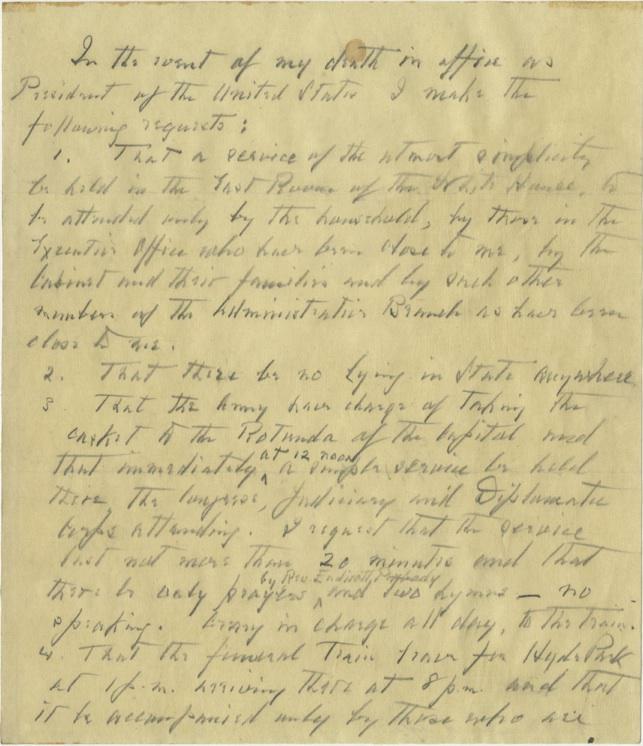 That a service of the utmost simplicity be held in the East Room of the White House, to be attended only by the household, by those in the Executive Office who have been close to me, by the Cabinet and their families and by such other members of the Administrative Branch as have been close to me. 2. That there be no lying in state anywhere. 3. That the Army have charge of taking the casket to the Rotunda of the Capital and that immediately, at 12 noon, a simple service be held there, the Congress, Judiciary, and Diplomatic Corps attending. I request that the service last not more than 20 minutes and that there be only prayers, by Rev. Endicott Peabody, and two hymns – no speaking. Army in charge all day, to the train. 4. That the funeral train leave for Hyde Park at 1 pm arriving there at 8 pm and that it be accompanied only by those who are to attend the interment. That the Navy have charge w/ the train and everything thereafter. 5. That on arrival at Hyde Park the casket be taken to St. James Church and a simple short service be held, the old neighbors of mine only being asked. Casket to be borne by Marines. 6. That then the casket be taken from the church to the house, and placed in front of the East fireplace in the big room for the night. 7. That the following morning the interment take place where the sundial stands in the garden, and that the casket be carried from the house to the garden by men from the place including the Brick [?] place and the back farms and Val-Kill Cottage. 8. That the interment be attended only by the family, the Cabinet, the President, the [? ], and…2 Senators and 2 Representatives. 9. That a gun-carriage and not a hearse be used throughout. 10. That the casket be of absolute simplicity, dark wood, that the body be not embalmed or hermetically sealed, and that the [?] be not lined with brick, cement or stones. The whole to be set on a marble base extending 2 feet out beyond the monument all around, but said base not to be more than six inches above the ground. 13. That only the Rector of St. James Church officiate at the interment. 14. That no moving pictures be taken at the place, and only 3 still picture camera men be allowed at St. James or at the house or garden. 3 newspaper men only, [?] press associations. 15. That a detail of Marines and state troopers guard the garden, house and grounds for a reasonable time and that the public be not admitted to the place until adequate arrangements can be made. 16. That any period of national mourning be limited to one month. 17. That subsequent care of the garden, house and grounds be arranged substantially in accord with memorandum covering this and enclosed with this.